Labor Day weekend is right around the corner and I like to think of it as the end of Summer and to me nothing says Summer like Watermelon. I had to make sure that I mixed up a batch of cupcakes that Riley would like this time around. You all know that she has a bit of a sweet tooth and absolutely no qualms about telling me like it is. I recently made Blueberry Lemonade Cupcakes, which after biting into she looked at me like Gordon Ramsay and stated, “Something’s different and I don’t like it.” She was right about one thing. 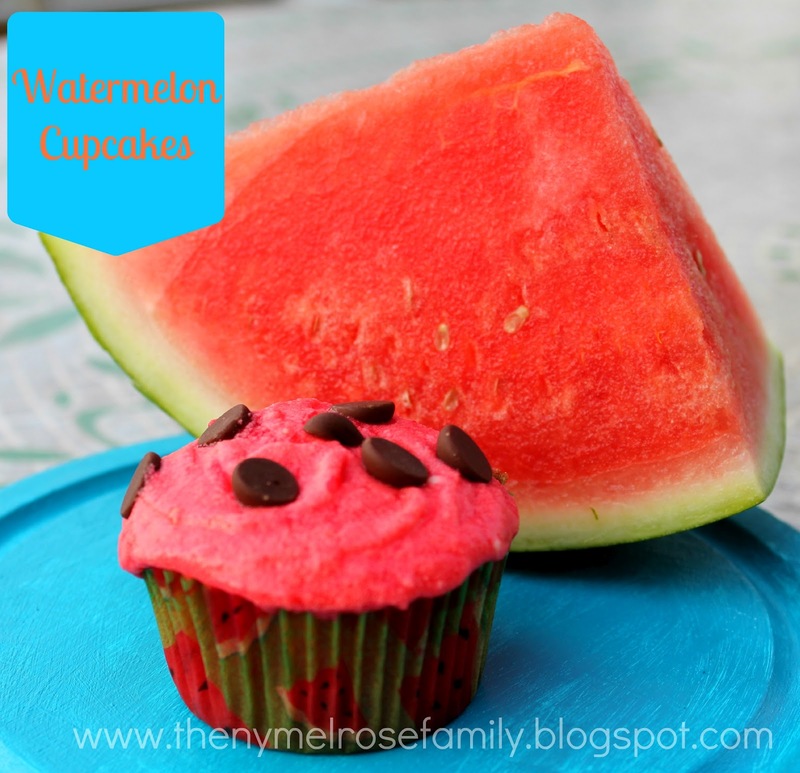 I changed up the frosting and it was a bit more grown up than her taste buds could handle, which is why I was a bit nervous to try Watermelon Cupcakes, but can you think of anything that says Summer more than watermelon? Luckily, Riley liked the cupcakes. Although, I’m pretty sure it was largely due to the chocolate chips on top! These look so good and they’re so fun for a cookout! I might try and make them this weekend! These are so adorable and they look YUMMY too!! Those cupcakes are too cute to eat. These came out adorable!!!!! Great job! The cupcakes look adorable. I bet they taste as good as they look. They look like summer. So glad you linked this up! Thanks for sharing at the Pomp Party! Pinning! I’ve never heard of watermelon frosting. They sound delicious. Stopping in from SITS. Thanks for sharing. Being a HUGE watermelon fan, I think these sound fabulous! 🙂 Thanks for this delicious post, I just may have try some this weekend! Stop by and visit! Always looking for new blog friends! These are the perfect way to end the summer! I love the color and the chocolate chips in the batter! I’m speechless. On the list for next summer. Thank you for posting this! Oh me oh my! These are so fun and they look delicious! Thanks so much for sharing at Mom On Timeout! I have got to make these for my sweet little girl…she will totally be impressed! Thanks for sharing at It’s Overflowing! These are so great! I am a follower of your blog on Facebook and would love if you could pop over to my new blog http://sarahsaturdiy.blogspot.com/ and share the blog love! These are so adorable and perfect for summer! Watermelon icing sounds delicious … and I love the chocolate chip “seeds”.